In a 4 part series focusing on the Portland Metro, our office’s new housing work covered the bubble’s impact on ownership by year and by neighborhood in Part 1. Today, Part 2 covers underlying trends in housing supply and demand. Part 3 will go over housing affordability in Portland, while Part 4 will provide an outlook. Beyond the housing bubble’s impact on prices and ownership in the past decade, it has tremendous impact on the level of new construction. 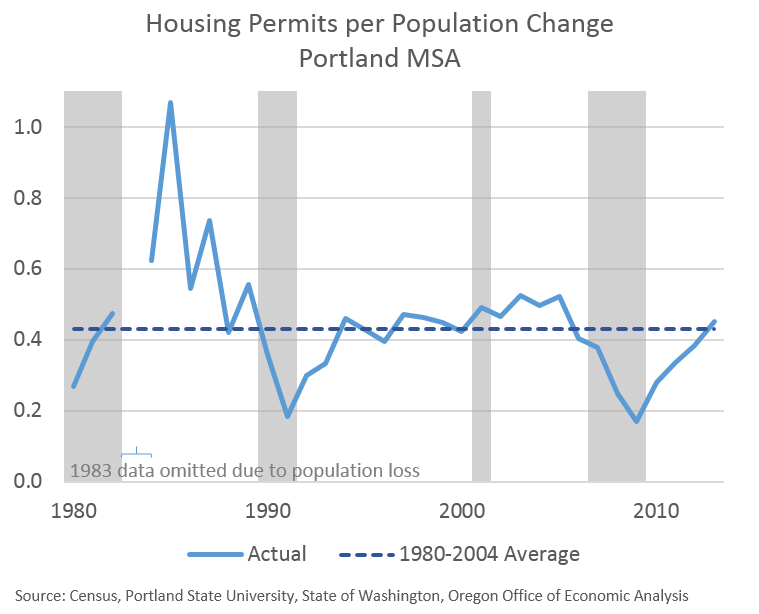 However, unlike the U.S. as a whole, the Portland MSA actually did not overbuild very much during the boom, relative to underlying population gains. The graph below shows the number of housing permits per population change. The average over the 1980-2004 period was one housing permit for every 2.3 person increase in population. This is somewhat lower than the number of people per household as reported in the 2000 Census (2.51 statewide, 2.56 in Portland). Even so the ratio did not increase much during the housing boom. This indicates that the level of new construction in the region was not far out of line with historical patterns, relative to the fact that more and more individuals continued to move to the region. While there was not much overbuilding during the bubble in Portland, the housing bust has clearly been disproportionate to the boom. Relative to the population gains to the metro area, a rough accounting from 2000 through 2013 finds that the number of new housing units built is about 2/3 to 1 year behind historical patterns. 2014 is so far on pace to be similar to 2013. While this under building relative to population growth is certainly manageable with a few years of stronger housing starts, it does indicate the housing market today is likely supply constrained, helping to drive prices higher for both ownership and rental units. Furthermore, indications of housing demand, if anything, are accelerating. 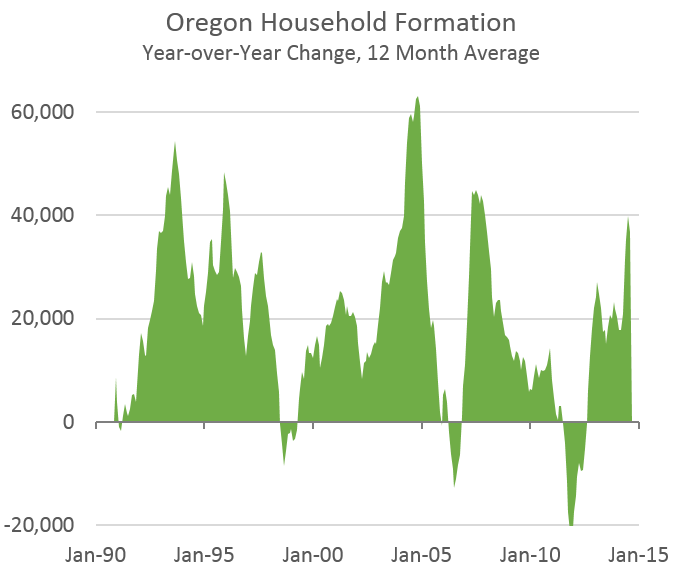 Even as household formation has slowed nationally, it appears to be picking up in Oregon. As the economy continues to improve — even faster than the typical state — the old, strong flows of in-migration to Oregon, and Portland in particular, are beginning to reappear. Now, the types of housing needed to meet this new influx of demand may be different. The Portland MSA continues to be a magnet for young, and mostly educated migrants. See here and here for more. As such, the region has a very large Millennial cohort, relative to the rest of Oregon and the nation. Ages 25-34 are very important in terms of setting down roots as this range is when most individuals, get married, buy a house, start a family, begin their careers in earnest and the like. However, at first, many are renters and not owners. As such, about half of all housing units built in Portland in recent years have been multifamily and even with high rents in these new buildings, vacancies are low. Economists and housing experts are in agreement that moving forward, a relatively larger share of new construction will be multifamily instead of single family, however, as will be discussed in the outlook section next week, the exact details are unknown. It is important to point out that Millennials (and Generation Xers) in Portland and Oregon are just as likely to be employed as elsewhere in the country. 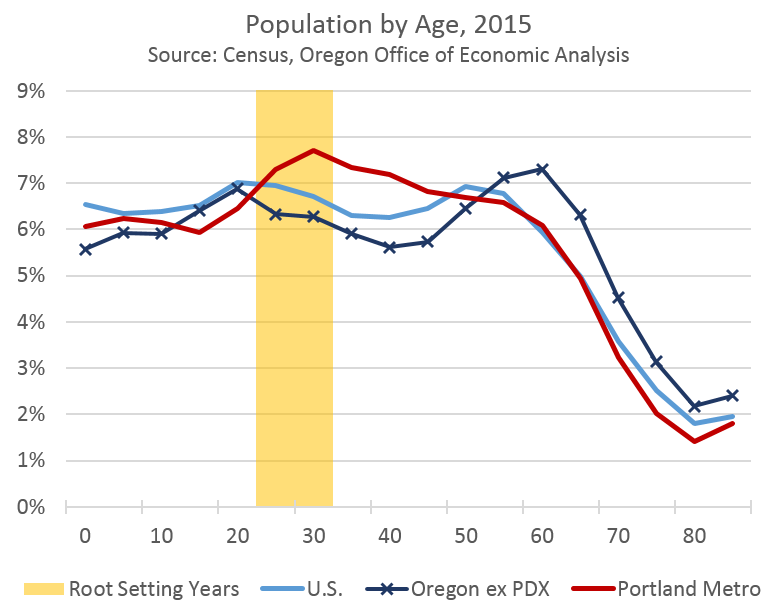 Portland is not (just) a place where young people go to retire. As these cohorts age, and the economy continues to improve, it should be expected that many transition into ownership over the coming decade, although it may be a higher share of condos and not purely detached, single family as in the 1990s and 2000s. Part 1 covered the housing bubble’s impact on ownership. Part 3 goes over housing affordability and Part 4 provides an outlook.